XFX Wave is a high quality wavetable oscillator. It features 70 unique wavetables. But that is just the beginning. Three advanced waveshaping mods, additive layering, and unison allow you to create unique, rich sounds. Unlike most wavetable oscillators, the mods are alias-free and FM features 4x oversampling for pristine fidelity. A wavetable oscillator is based on a set of recorded single-cycle waveforms. A table consists of 256 single-cycle waveforms that can be individually selected using the position control. The 70 raw wavetables can be manipulated using the mods (modifiers), translating them into other unique waveforms that can sound quite different from the original. Each oscillator has up to 3 modifiers that can be active simultaneously. An Additive Engine allows you to duplicate the waveform at harmonic multiples of the original. To top it off, unison creates thick sounds using multiple detuned copies of the waveform played simultaneously. All of these features make XFX Wave a powerful force to be reckoned with. It creates great sounds immediately with plenty of room for endless tweaking. 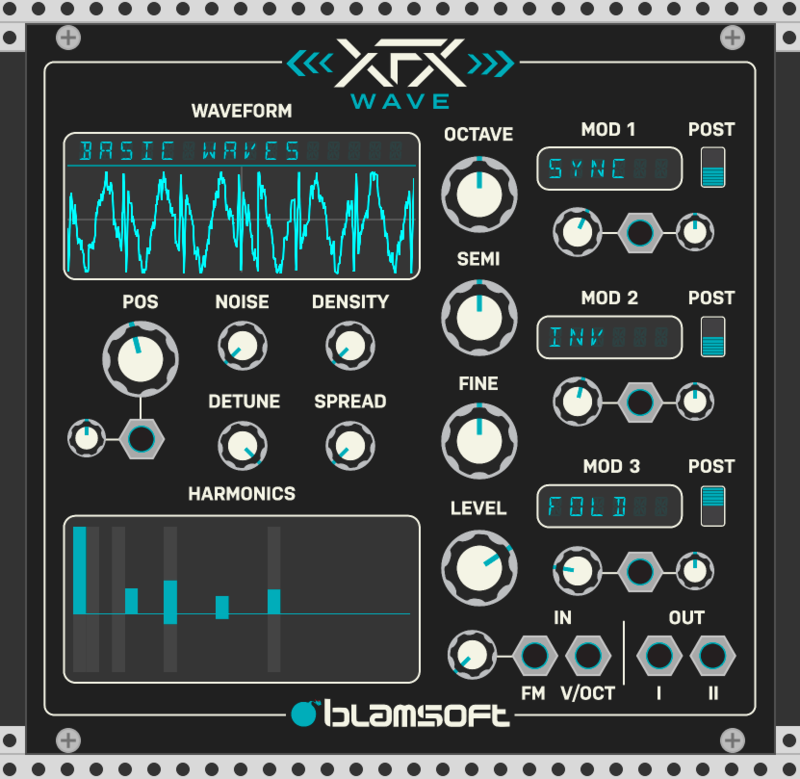 XFX Wave is a module that can be downloaded for free in VCV Rack’s Plugin Manager.